After my mascara post a few months ago, I decided to go ahead and get the Sephora LashStash Mascara Deluxe Sampler. This thing comes with 10 high end deluxe-sized samples of mascara. Since Dior didn't wow me, and I'm still loving the cheapies - I decided to give this a try to see if I could find something to perk up my eye lashes and in the meantime, I'll review each one as I use them. 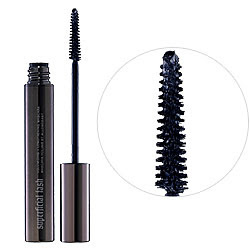 I've used this mascara for a few weeks now (it's about gone now, but 3 weeks of use isn't bad at all! ), and I could never use it alone. PROS: It did a nice job in lengthening my lashes. No smell. Not clumpy. CONS: No thickening at all. The color was pretty light. No wow factor. Disclaimer: it's hard to take pics of your eyes so close without looking like something out of a fun mirror. The eye to your right is mascara free. My natural lashes are relatively long, however, they are light and thin, so hard to see. The eye to you left has hourglass mascara applied. I would not buy this sucker for $26. You could easily find this kind of result in a drugstore brand for cheap cheapity cheap.